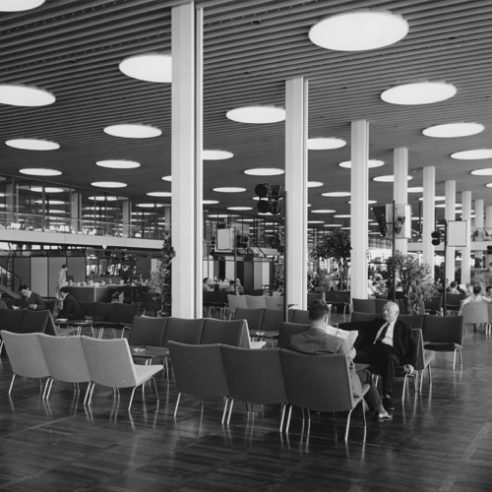 In the 1990s the sofa version of the Airport Chair was designed especially for Kastrup Airport in a collaboration between Wegner and his daughter, Marianne. It has a tubular steel underframe, and steel sides that can be equipped with armrests where desired. When Finnish architect Yrjö Kukkapuro was commissioned to fit out the SAS terminal at John F. Kennedy Airport in the late 1960s, he chose another of Wegner’s easy chairs, AP40, for the airline’s economy-class transit area. Designed in 1958 for A P stolen, Hans J. Wegner’s Airport Chair was briefly produced in 1994 by Fredericia Furniture before being taken up by Carl Hansen and Son and renamed CH401. CH401 distinguishes itself by being a modern and minimalistic chair that is easy to get up from, making it well suited as an easy chair in public buildings. This was also the case when its variant, AP39, was purchased by Copenhagen’s Kastrup Airport giving the chair its name The “Kastrup” or Airport Chair, the latter being the name Wegner himself chose to use. referred to as ‘the Angle Chair’. Today, however, this is a rather confusing description since it can be applied to many of Wegner’s designs – not least of all GE370 and GE34, which are both manufactured by Getama. Originally a lowstool and dining room chair were also part of the Airport series, but these have been discontinued. Even though furniture made of steel is not what one usually associates with Wegner, it was far from a rare occurrence although even his steel chairs often featured some visible part made of wood, typically the top rail. For example, Wegner decided that his own dining room chair (PP701) should be a combination of the two materials The same combination holds true for his iconic Swivel Chair. While one cannot see the wood in Wegner’s upholstered chairs such as the Ox Chair or CH401, it’s there in the form of the inner frame. Like the Ox Chair, CH401 consists of a beech frame, covered with foam rubber upholstered in fabric or leather, with legs and underframe of stainless steel.